What is a Wonderwall, anyway? 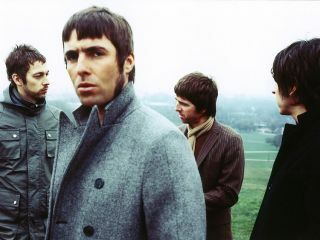 Oasis' belting one-liner "You're gonna be the one that saves me" has been voted as one of the most common misheard lyrics of all time. The Police top the chart for When The World Is Running Down with Bee Gees' Stayin' Alive and The Beatles' Lucy In The Sky With Diamonds at second and third respectively. The survey, carried out by hearing aid retailer Amplifon, discovered that deaf or hard of hearing Wonderwall listeners actually hear "You're gonna be the one at Sainsbury's". We've touched on this subject before, citing Bruce Springsteen and Led Zeppelin among our top listening errors. And, although the 'hard of hearing' are no laughing matter, would anyone mind if Kate Bush actually did wail "Heathcliff, It's me, I'm a tree, I'm a wombat"? Lyric: "You make the best of what's still around"
Misheard as: "You make the best homemade stew around"
Lyric: "It's alright, it's okay. You may look the other way"
Misheard as: "It's alright, it's okay. You make love the other way"
Lyric: "The girl with kaleidoscope eyes"
Misheard as: "The girl with colitis goes by"
Lyric: "She moves in mysterious ways"
Misheard as: "Shamu the mysterious whale"
Lyric: "Michelle ma belle, sont les mots qui vont tres bien ensemble, tres bien ensemble"
Misheard as: "Michelle ma belle, some say monkeys play piano well, play piano well"
Lyric: "Scaramouche, Scaramouche, will you do the Fandango"
Misheard as: "Scallaboosh, Scallaboosh, will you do the banned tango"
Lyric: "A year has passed since I wrote my note"
Misheard as: "A year has passed since I broke my nose"
Lyric: "Strange fascination fascinating me"
Misheard as: "Strange vaccinations are killing me"
Lyric: "You're gonna be the one that saves me"
Misheard as: "You're gonna be the one at Sainsbury's"
Lyric: "Heathcliff, It's me, Cathy and I've come home oh, so cold, let me in-a your window"
Misheard as: "Heathcliff, It's me, I'm a tree, I'm a wombat. Oh, so cold at the end of your winter"